University is an exciting and busy time for any student, whether you’re just beginning your first year or you’re graduating and preparing to venture into the working world. Whilst it can be easy to get swept up in the moment and indulge in the student lifestyle, it’s important to make the most of your time at university and ensure you leave with great skills that you can use later in life. Whether this is business acumen, a vocational qualification, or excellent contacts who can help you to find employment after graduating, there’s a lot that university can offer besides a degree. The friends you make at university are likely to be with you for life. One of the best things about the university experience is meeting so many different people, from all parts of the country and even further afield. You will have plenty of opportunities to make friends with like-minded people and build lasting relationships. To begin with, it is vital that you attend your lectures and seminars. Not only will this help with your studies, it will also offer the opportunity to connect with your classmates and tutors. Having a good relationship with your tutors may also help to open career paths when you graduate. Another good way to meet new people is by signing up to different sports teams and societies. Ask your Student’s Union about signing up to any of these – you may find something a little bit unusual that takes your fancy. These extracurricular activities can really set you apart from other candidates when it comes to applying for jobs after you graduate. To complement your studies, there may be volunteering programmes or apprenticeships that you can enroll in. These opportunities can be really valuable, enriching your learning within your chosen field. Hands-on practice within your industry is especially rewarding and will be commended highly by future employers. Many universities require work placements as part of the degree. It is essential to make the most of these opportunities: seek a placement that is related to your desired career path, and try to learn as many things during this time as possible. Never be afraid to ask questions along the way in order to gain insight. Even if a workplace or apprenticeship doesn’t evolve into a full-time postgraduate job, the people you meet during this time may be able to suggest other opportunities, which is another reason why it is so important to build connections. Attending your lectures and seminars, and meeting all of your assignment deadlines, will really help you to achieve the best results. 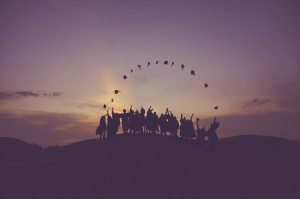 Dedicating time and effort to your studies and any extracurricular activities is truly rewarding when you finally graduate with your degree. Higher education is a big step up from school and college. You will be required to work independently a lot more so it is important to remain focused and devise a study routine that works best for you. Some courses may have very little contact time with tutors or in lectures, so you need to be conscientious in working hard outside of university hours. During your time at university you will have access to so many different opportunities that go beyond your degree itself. As well as volunteering programmes and apprenticeships, there may be one-off events, schemes or charitable projects that you can get involved with. Take every opportunity that excites you and make the most of the chance to try and experience new things. Keep an eye on what is happening on campus and in your city. Depending on your course, there may be university-led or community-run events or festivals, such as open mic nights, tradeshows or ask-the-expert talks, which are fun and could have the potential to boost your learning, as well as allow you to network with people in your desired field. Getting the right balance between your studies and your social life is something that a number of students struggle with. Your university experience is what you make of it though, so it is crucial to get this balance right. The work and time you put into your studies really will reflect in the end grades, whilst the extracurricular and social activities you take part in will help you to become more rounded as a person. Make the most of all of the opportunities that arise during your time at university and tailor your experience to your advantage. Pure Student Living provide luxurious student accommodation for students across London and the UK.